Where is the NM bottleneck? The current status of the NM process, with 1 NM awaiting FD approval, 7 awaiting DAM approval, and 30 waiting for their accounts to be created, leads people to thinking that the big bottleneck is the account creation stage. However, when you look at what happened since december 2005, it’s not that simple. See the graph linked above, which shows where people are waiting. While it seems that the FD stage hasn’t been blocking people for nearly a year, it’s the DAM stage which has been the biggest blocker. Indeed, on average, 8.3 NMs have been blocked by FD, 16.2 by DAM, and 9.0 by account creation. I understand that processing NM reports in batch mode makes it more efficient. However, I’m wondering if processing them 20 per 20, is really that more efficient than processing them 5 per 5, which would justify such long queues. 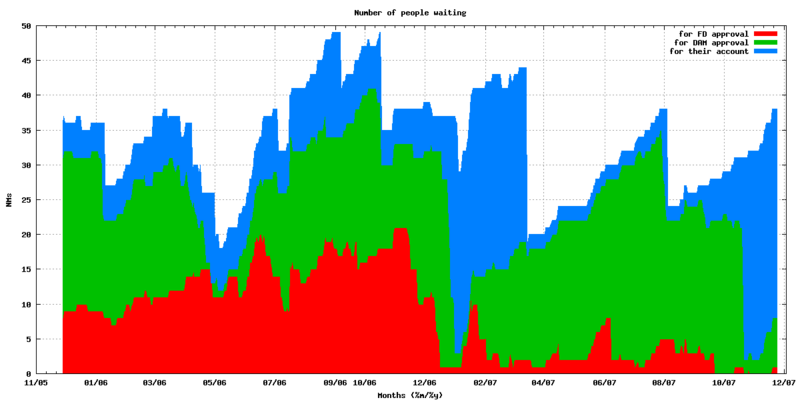 The NEW queue, which used to be a problem, is now being processed on a very regular basis, and hasn’t grown widely recently, except after Debconf when the ftpmaster processing NEW was on VAC. Couldn’t we have the same thing for DAM, account creations, and while we are at it, removals from unstable? Having clearly defined human-crontab-jobs would certainly make working on Debian less frustrating. > allowed for the recent increase in NEW processing. I’m not sure that’s true: I think the ftpmaster processing NEW is an “old” ftpmaster, not the one that got in recently. Would you consider including “waiting for FD to assign AM” in that list? I agree with #3 – it was looking at the mean wait times for AM assignment and its weak correlation with number of AMs that made me think NM may be fundamentally flawed.